If Dominicans are as passionate about the environment as they say they are, they would observe Earth Day, commemorated all over the world on Friday, 22 April, as faithfully as they acknowledge our Independence Day. But Earth Day is largely ignored in the Nature Isle whose Coat of Arms proudly declares: "Apres Bondie C'est La Ter', (After God the Earth) to remind us of the importance of the soil and the environment to the future prosperity of Dominica. Isle of beauty, isle of splendour Isle to all so sweet and fair All must surely gaze in wonder At thy gifts so rich and rare Rivers, valleys, hills and mountains All these gifts we do extol Healthy land, so like all fountains Giving cheer that warms the soul"
Dominicans are also puzzled by the Government of Dominica's as well as civil society's nonchalant attitude towards World Environment Day (observed the world over on 5 June), World Rivers Day (observed on 25 September) and World Water Day (22 March). In the past, we have suggested that the Ministry of Tourism should make World Rivers Day, for example, one of its most important calendar events simply because more that ninety percent of our tourisms sites depend on the state of our rivers. Undoubtedly, the Ministry of Tourism must have noticed that many of these water sources, that is our tourism product, are dead or near death. Many environmentalists have predicted that unless the trend is reversed urgently Dominica will have few water-based tourism sites in a couple of decades. But in all the notable days that we mentioned earlier, Earth Day has special significance for Dominica. Even if one argues that Earth Day is a global "feel good gimmick" that we do not need to be part of, billions around the world believe the event can be an opportunity to ensure that the next generation do not repeat the same mistakes as their parents. Earth Day, therefore, provides a moment of reflection to acknowledge our collective missteps, as the Montreal Gazette Board stated in recent editorial. The newspaper stated: "Instilling in youngsters a duty of stewardship toward the environment and encouraging them to live their lives in ways that leave the smallest possible footprint on the planet can indeed be an agent of change, albeit one that takes time to have an impact. Telling children why it's important to walk rather than drive, eat local, grow gardens, to reduce, reuse and recycle can form healthy habits from an early age. With any luck, these simple lessons may also rub off on parents trying to set a good example and put their words into action." According to Wikipedia Earth Day is an annual event, celebrated on April 22, on which day events worldwide are held to demonstrate support for environmental protection. It was first celebrated in 1970, and is now coordinated globally by the Earth Day Network, and celebrated in more than 193 countries each year. Significantly, on Earth Day 2016, the landmark Paris Agreement is scheduled to be signed by the United States, China, and some 120 other countries. This signing satisfies a key requirement for the entry into force of the historic draft climate protection treaty adopted by consensus of the 195 nations present at the 2015 United Nations Climate Change Conference in Paris. Numerous communities celebrate Earth Week, an entire week of activities focused on environmental issues, Wikipedia states. -Trees help combat climate change. -Trees help us breathe clean air. -Trees help communities achieve long-term economic and environmental sustainability and provide food, energy and income. 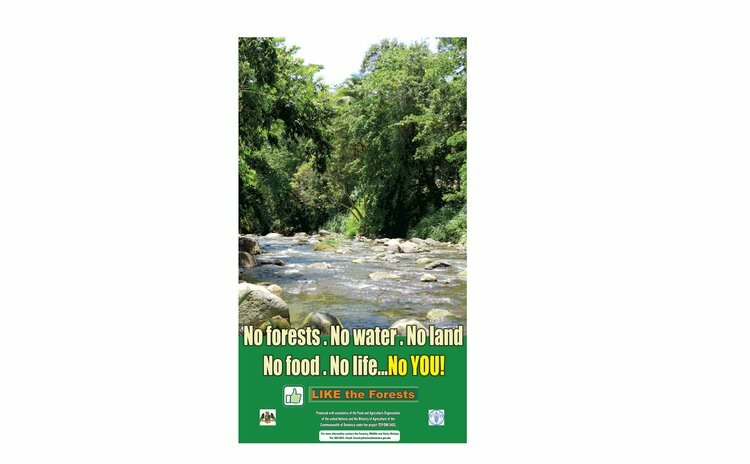 (See the poster, reproduced here, prepared by Dominica's Forestry Division that highlights the value of trees and forests). With the beginning of the 2016 hurricane season just around the corner, bearing the threat of another Erika-type event, we believe Dominicans would be well advised to consider taking the message of Earth Day much more seriously.